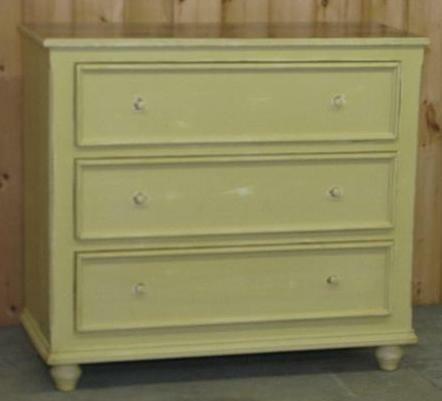 Cottage Style Large Chest of Drawersa roomy dresser made in a simple, charming country style, measures 48W x 20D x 43H. Available in the color choices listed in the above thumbnail. (Click for larger view) Other colors are also possible, we can color match any of the paint or stain colors available from any nationwide paint stores including Home Depot, Lowes, Sears, or Benjamin Moore. Please note that all barnwood differs slightly so that no two pieces will be exactly alike. Paint and stain colors also have a slight variation as well, and are not always an exact match to the photos that are shown online. The cottage chest of drawers as well as the rest of the cottage line, remind me of summers past on the shores of Cape Cod. This furniture captures the essence of simplicity and tranquility. Large Cottage Style Dresser with three roomy drawers. Choose from the listed color options shown or provide us with your choice of a custom color! Measurements for this piece are 42W x 18D x 36H.